Man cannot live on bread alone. Conjure water, too. I couldn't find a fan site for one of the best roleplaying games ever invented, so I decided to make one. If you've never heard of Dinky Dungeons, you're in for a real treat. This game is a piece of RPG history. Though it isn't widely known, it had an impact on the rules development of other games. If you've heard of Dinky Dungeons and you're nostalgic about it, please take a moment to visit the Guest Book and tell us about your Dinky adventures. Advice From The Grizzled Veteran: "Bring chalk. Mark doors and corridors to aid in navigation. Mark traps that you have bypassed." Adventurer's Horoscope: Be prepared to face a large group tomorrow. They won't find you if you hide behind the fishmonger's stall. Famous Last Words: "Boost me up." Click here for today's Dungeon Note by Jeff Perryman! This site was last updated on Thursday, August 24, 2017. Thanks to scans sent by Dinky Dungeon fans, we're expanding our artwork collection. Writing is underway to finish our Dinky Dragons modules. We're also working on a Dinky Dungeons Facebook page so that players can chat and share media with each other. The first full module is complete, including maps, NPC statistics, and sample dialog. Bold adventurers can now explore the Tower of Dark Sorcery. This combat-light module is a humorous tale of a grumpy old wizard, a mysterious witch, and a clever young genie. Characters can gamble at the inn, chase a pesky phooka, explore an ancient tower, and perhaps even help two old rivals become star-crossed lovers! Have ideas for a Dinky Dragons rules addition, supplement or module? Submit your idea - we'll publish it on this site and give you full credit. Especially good submissions will earn a gift certificate to J!NX or Think Geek, your choice! Looking for Denton (Doc) Elliott! I'd love to exchange emails with Denton R. Elliott. If we're lucky, perhaps he'll give us a short interview with comments and memories about this amazing game. If you know how to contact anyone involved in the creation or playtesting of Dinky Dungeons, please send me an email! 8/24/17 - Links and Facebook page have been updated. 5/13/16 - Errata has been added to the Dinky Dungeons rules. 8/10/15 - New artwork has been added from the original books. 6/5/14 - Added links to game-finder sites. 1/28/13 - We have moved to GoDaddy web site hosting. Please report any problems by sending me an email, thanks! 10/13/12 - Revision 5 of Dinky Dragons is available for playtesting. 7/1/12 - New artwork has been added to the Art & Photos section. 10/7/11 - Added combat maneuvers for Warriors, Rangers and Rogues. 8/25/11 - A new trivia game category has been added, Fantasy Movie Quotes. 7/8/11 - The site graphics have been upgraded, thank you Jeff! 6/27/11 - Read an interview with artist and level designer Jeff Perryman. 6/21/11 - Roleplaying Video Games category has been added to the trivia game. 6/6/11 - Page layout, graphics and printing capabilities have been upgraded. 5/20/11 - The Error 404 page has an important message from the CDC. 3/4/11 - The Bestiary has been expanded to 88 monsters. 2/1/11 - New original Dinky Dungeons artwork has been added. 1/24/11 - Racial spells have been added to the Spellbook. 12/27/10 - New photos of Dinky games and comics have been added. 8/9/10 - Thanks to Dean Henderson, we have more photos and scans of Dinky games. 6/29/10 - Adventurer's Horoscopes have been updated. Enjoy! 6/23/10 - The photo page has been completely redesigned. 6/4/10 - The first full module is complete - The Tower of Dark Sorcery! 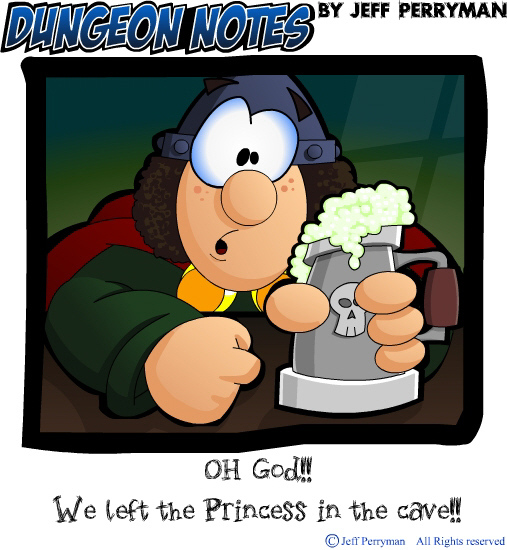 4/26/10 - Revision 4 of Dinky Dungeons is now available for download in PDF format. 4/16/10 - Magic rules moved to their own page, and skill rules have been expanded. 4/10/10 - Added games - The Dragon and the Wizard, and Kingdoms: Nobility. 4/1/10 - Revision 3 of Dinky Dragons has been sent to playtesters. 1/25/10 - Plot hooks have been added to all modules. 12/9/09 - With the release of the latest PDF, round three of playtesting begins! 11/6/09 - Added a random character generator. 10/17/09 - Changed the Guest Book security. Hopefully no more spam. 10/5/09 - New category added to the trivia game - Gamer Movies. 9/30/09 - Revised traits, spells, gear and character sheets after beta testing. 9/21/09 - I've won my first web award, the prestigious "Indeed!" from Big Trouble In Little China, thanks to Josh from the Wing Kong Exchange.